Pubcon officially kicks off Tuesday morning in Las Vegas, and we have many contributors presenting their amazing knowledge on their topic areas. Pubcon is *the* networking event of the year, so please feel free to stop and say hi during the week. There are also many events that many of us will be attending throughout the week, including the Epic Dinner Monday night, PurposeInc Poker Tournament Tuesday night, US Search Awards on Wednesday night (Jennifer Slegg and David Szetela are judges this year), as well as the usual unofficial bar of Pubcon at the Breeze Bar at Treasure Island where you will find most attendees hanging out by the end of the night. 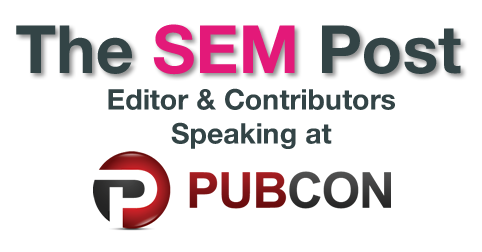 And of course, if you are interested in writing for The SEM Post (or doing some live blogging at Pubcon), please contact us or chat with Jen during the week.